My mantra when it comes to suits is the following: when you buy a suit you’re not just buying a suit. It’s something I’ve said before and will likely say again. However, when you break your suit into separates, some pieces are definitely easier to style than others. Using the jacket as a blazer, for example, is a no-brainer. A waistcoat alone can also be fairly simple. However, the hardest piece of a suit to style as a separate is often the pants. Here’s one way I took the pants from my plaid three piece suit and used them in a much different context. Suit pants can be difficult to style as separates for a few reasons. First, the fabric may be a higher quality than some of the other items you might want to pair them with, which can look extremely wrong. Second, sometimes we’re simply too busy to think creatively and outside of the two- or three-piece suit box. And finally, if your suit is patterned—especially if it’s a bold pattern like a big plaid—it may seem unnatural to try and mix it up with anything other than the matching jacket or waistcoat. As always, being open to new ideas and having a willingness to experiment is the first step. 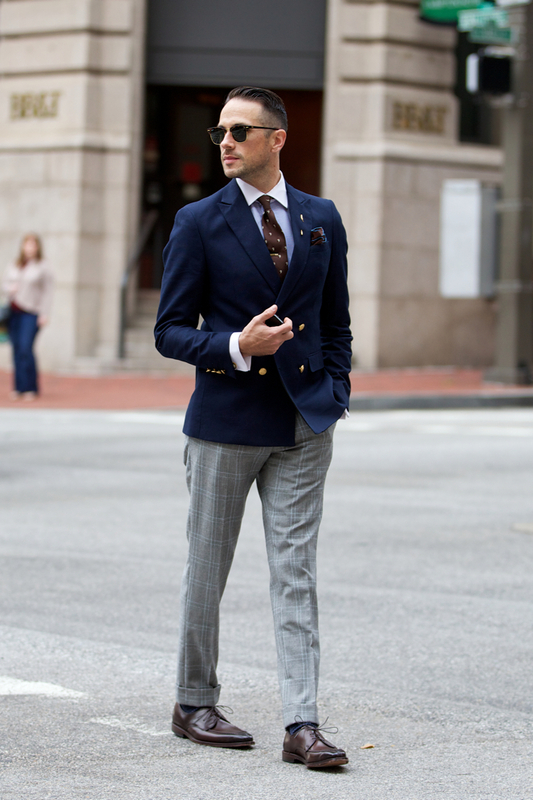 More specifically and practically, if you’re dealing with plaid pants an easy way to wear them alone is to pair them with a solid blazer in a neutral color. Navy and grey work great together. If you’re feeling adventurous, try adding in some subtle patterns like a thin horizontally striped shirt. From a distance it appears solid, though up close it’s much more interesting. I’ve mentioned before that I find the style of Italian men extremely inspiring. And I have to admit that that was on my mind to some degree when I put this look together since I was headed to Venice for the weekend. More on that shortly, but it’s the attention to detail without calling attention to the details that is so wonderful. A pocket square folded just so. An unexpected mix of patterns. Or a unique piece integrated so seamlessly into an outfit that you can’t imagine it without it. All pulled off with a carefree nonchalance. This is what inspires me about Italian style. Great Outfit, Very Classic and Clean. Love It. Thanks, as always, Igal. Have a great day. Was quite iffy about that asos jacket (lengthwise) but these images have sold it for me. Sharp as always my good man. You have such impeccable taste! I love the detail shot of the watch, cufflink (fun) and monogram! Especially loving the details her – The double breasted buttons, the cuff links, the tie clip… Perfect styling! Thanks for the comment, Caity. And thanks for reading. I would like to suggest this shop because in my opinion is one of the best producer and seller for the italian style. Here the fashion is not only business but true lifestyle.. I recently started reading your site, and while I love suiting, my position (office manager) never seems to lend well to it. I tend to feel overdressed. What would you recommend to stay fashion forward and classy while still being business casual? First, so glad to have you as a reader, Josh. Hope you can find some inspiration on the blog. Seems like what would be a good fit for you is what I like to call sharp casual. Dressed up without going overboard and casual enough to easily transition from day to night. Check out the Lookbook for some inspiration. You can search by ‘Sharp Casual’ under ‘Occasion’ as well as by item of clothing, shoes, season, etc. Thanks for the quick reply! That i definitely more along the lines of what I need to be looking for! This is an awesome inspiration, especially as a fellow musician. Also, being from Northern VA, is it worth the trip to Baltimore to go to Quintessential Gentleman for tailoring/hair? It’s been a huge hassle to find anyone worthwhile in my area for either. I’m biased, but I certainly think so. I’m not familiar with tailors/barbershops in DC, so I honestly can’t advise if there’s anything closer, though I’m sure there are good tailors and barbers down that way as well. Definitely give QG a try and make sure to tell them I sent you! Very nice. What about paring a striped pant with a sport coat. How would you make thta work?